Born in September 1975, Chris Latham is Australia's second highest all time try scorer and also enjoyed a spell with Worcester in England. A strong-running fullback, Latham made his international debut in 1998 against France at the Stade de France and went on to win 78 caps, 68 as a starter and scored 40 Test tries. His last international appearance came in France during Australia's World Cup exit to England at Stade Velodrome, Marseille in 2007. 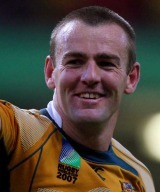 He is Australia's most-capped fullback. Latham missed out on a starting berth in the 1999 World Cup win despite featuring in the earlier games, but by the time the British & Irish Lions arrived in 2001 the Waratah was a more prominent member of the squad, starting the first Test defeat in Brisbane and coming on as a substitute in the second Test. He is second on the list of all time World Cup try scorers with 11, but Latham missed out on the 2003 final in Australia to league convert Mat Rogers as England claimed the Webb Ellis Cup. He hit his peak after that event, winning his place in 2004 and his 50th cap against Scotland that year. In 2005 he won Super 14 player of the year for the fourth time, while he won eight caps at fullback. Latham claimed the John Eales medal in 2006 after a stellar year in which he vice captained the Wallabies twice and scored five tries and while he underwent knee surgery which ruled him out of the Reds season, he returned to start all of Australia's five World Cup matches in France. Latham played club rugby for Randwick before representing the Waratahs and Queensland Reds, winning 90 Super Rugby caps. He moved to Worcester in 2007 and will return to Australia at the end of the 2009-10 season.